Nephew's BBQ Sauce (Garner, NC) makes some of the coolest alternative BBQ sauces you'll ever find. Their formula of pairing fruit with hot peppers has yielded some unique combos like Haban Orange, and Ghostly Pumpkin. Though the ingredients sometimes seem off the wall, Nephew's skillfully blends the flavors for sauces that stand out for all the right reasons. I loved the daring combination of pumpkin and ghost peppers in their Ghostly Pumpkin sauce and have been looking forward to tasting their other flavors. I got the chance to use Nephew's Peachy Potle sauce recently and found another perfect marraige of sweet fruits and chilie peppers. Peachy Potle is a relatively thin blend of tomatoes, vinegar and peaches. The sauce is packaged in 16 oz mason jars and pours very quickly. It's dark orange (almost brown) in color with finely ground spices that are barely visible. The sauce smells sweet and smokey with the chipotle pepper being the most noticable element in the aroma. The flavor is sweet, smokey and very tangy. Their is a slight element of spice from the peppers, but it's mild. Out of the jar, the vinegar tang really stands out, but the mild peach sweetness takes over when the sauce is heated. I used Peachy Potle on grilled chicken breasts, smoked chicken quarters and spare ribs. The sauce worked well on all three meats, but I thought it especially paired well the smokey pork ribs. I've always enjoyed peach as a complimentary flavor to pork. Though thin, the sauce still brushed well on the meat as a finishing sauce leaving a nice shine. Peachy Potle is another winning combination from Nephew's BBQ. 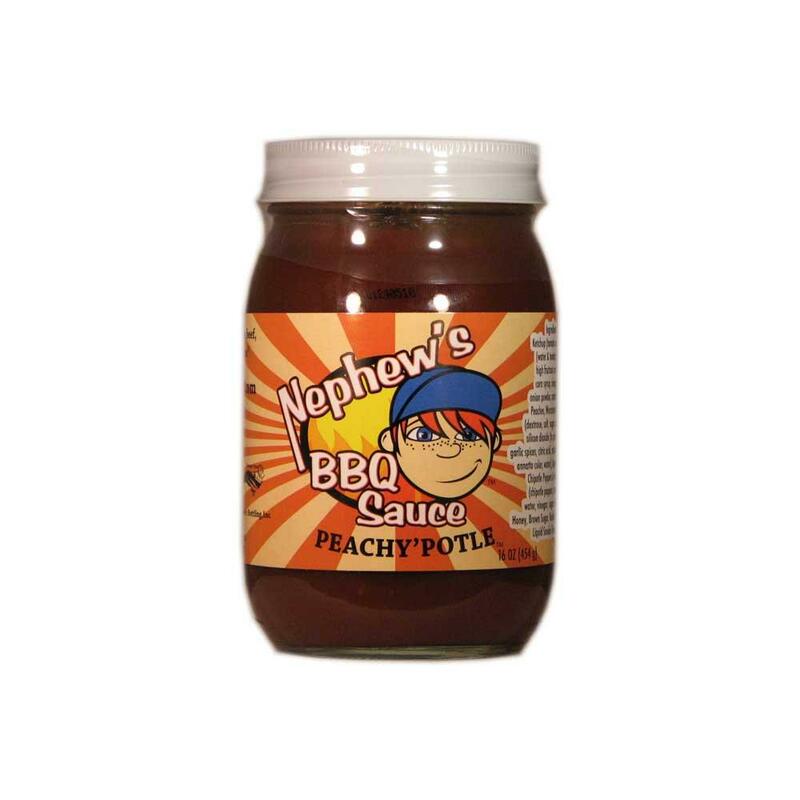 The sauce is at it's best when heated up and can be served on a variety of meats. If you're looking to break away from the norm and experiment with new flavors, Nephew's BBQ is a good place to start. Check out their website to see of their products. 1 Response to "Nephew's BBQ Peachy Potle"
Nice review! My favorite so far out of the Nephew's line is probably the Cherry 'Potle.